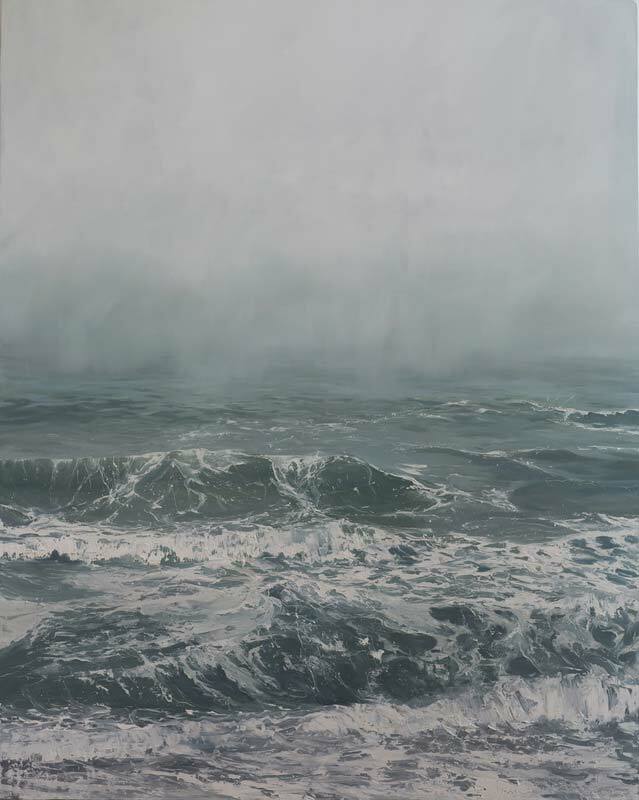 “I identify with the ocean when a storm is brewing or passing, when the surf is up, when flurries form, when the fog looms or is lifting, when the horizon is obscured or the sky begins to clear. There’s a different beauty and experience available on these less typical beach days. For the past five years, Wildey has called the coast off Mystic, Connecticut home. She moved to New York at age 24 and worked at the British Consulate. In 2006 at 40, she decided to pursue art full time and enrolled for an MFA at The New York Academy of Art. Later, travel awards afforded her chances to paint in Normandy and St Barts, French West Indies. 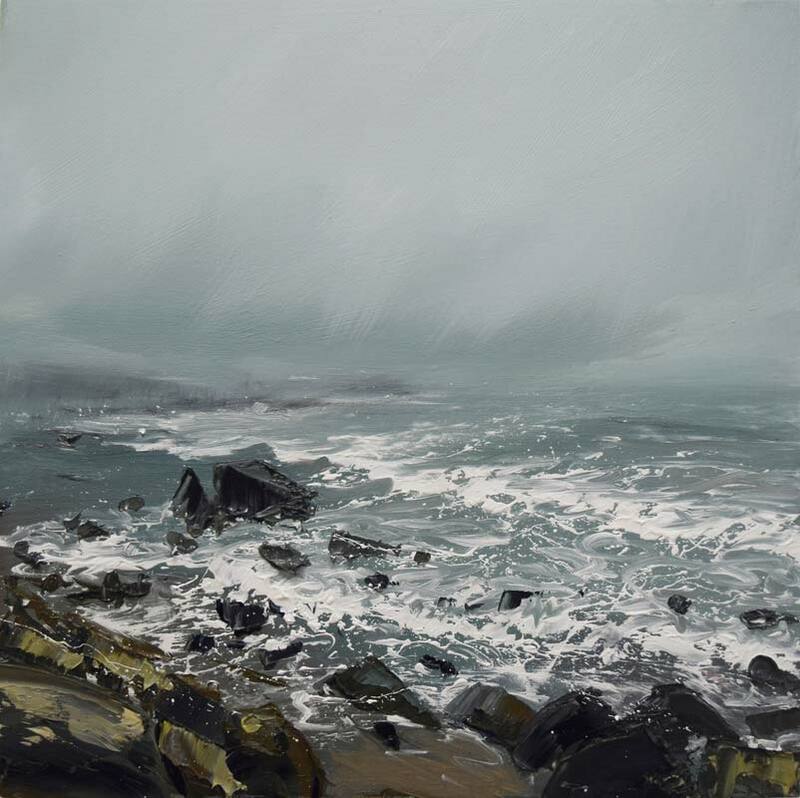 Interested in the formal aspects of painting, Wildey admires numerous artists including Turner and Andrew Wyeth, contemporary British figurative painter Jenny Saville, landscapists Eric Aho and Claire Sherman, seascapist Ran Ortner as well as German artists Gerhard Richter and Anslem Keifer. Wildey now paints year round in large and small formats. 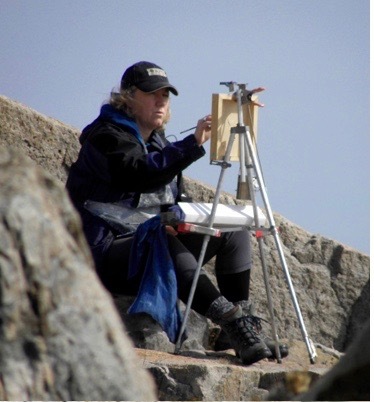 She enjoys plein air painting, but most of her exhibition work is created in her studio from reference photographs. “My photos are a starting point but the process is fluid. I like accidental marks so I’ll splash, I’ll splatter, I’ll drag paint so those marks determine the direction that the painting goes. I’m not driven by rendering an exact scene. It’s more catching the experience, conveying a moment’s energy and motion. 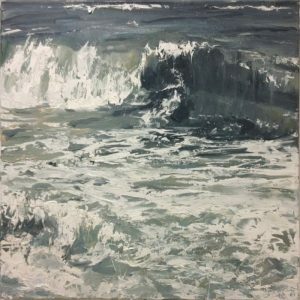 Working primarily in oils, Wildey uses a somewhat subdued palette to create the many moods of the sea. She favors house painting brushes, numerous palette knives and spatulas. 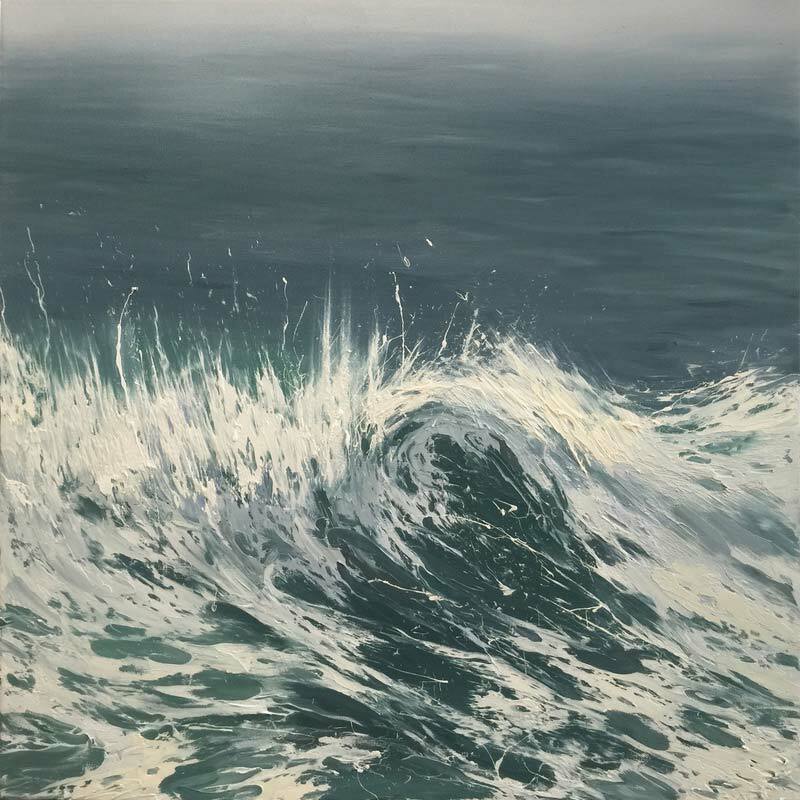 “I’d like an emotion to come through in the work whether it’s a quieter, more melancholy feeling or the rush and energy of waves that might fit in a more optimistic work. “The ocean is a place where I can feel connected and grounded. It’s constantly in motion, as are our thoughts, moods and experiences. We can feel angry one minute, melancholy the next and quite calm and content another moment. Being by the ocean and painting the ocean, soothes and calms me. 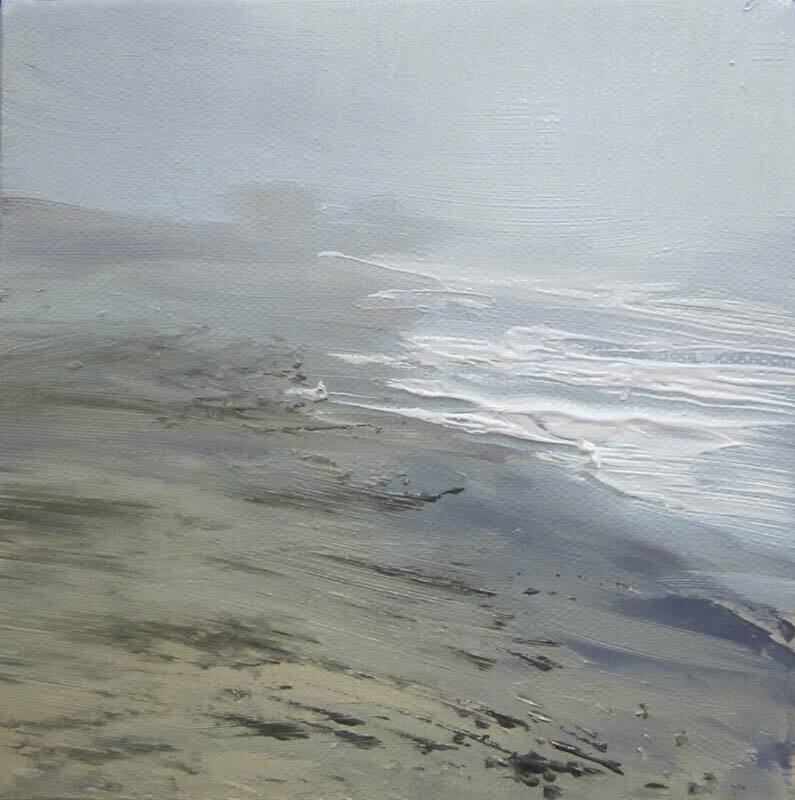 Also long attracted to environmental scenes, she paints what’s at hand. When she lived in New York, Wildey was attracted to urban scenes, “looking for or conveying a moment of beauty in an industrial experience. “I loved living in a coastal urban metropolis. 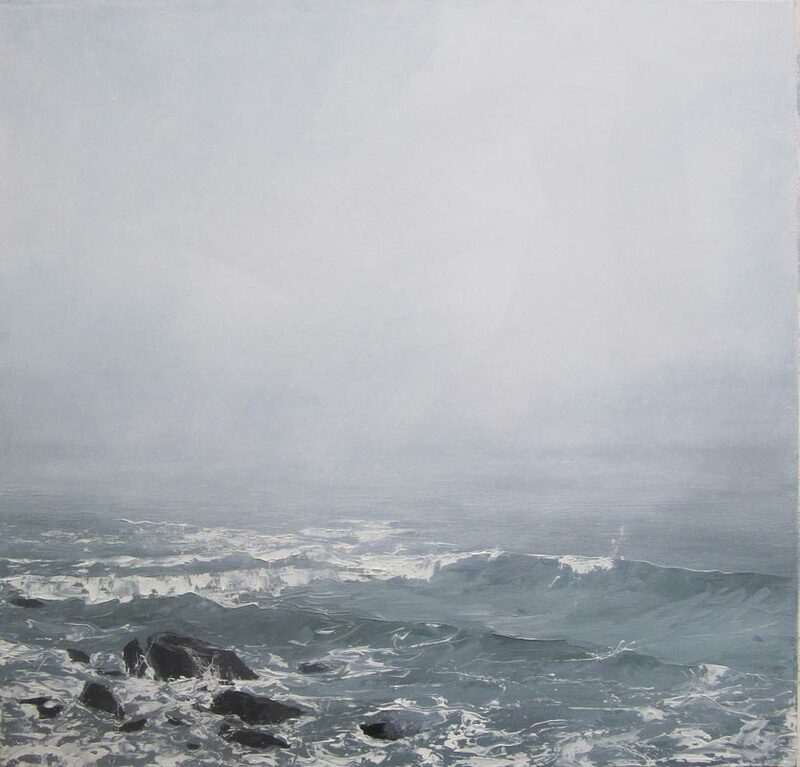 But it wasn’t until I spent two years as artist in residence at the William Steeple Davis House on the east end of Long Island, that I directly experienced the ocean at its finest and its fiercest and looked to the ocean as my subject matter. “The sea was feeding my soul and I saw the challenge in trying to capture something constantly in motion and constantly changing. Because of water’s changing nature, it’s a pretty endless subject that sustains me. “While I can appreciate the mountains, the plains, and cities, living near the water is essential. I’d feel claustrophobic if I didn’t. The light and air feels clean and fresh, I think it’s healthy mentally and physically. 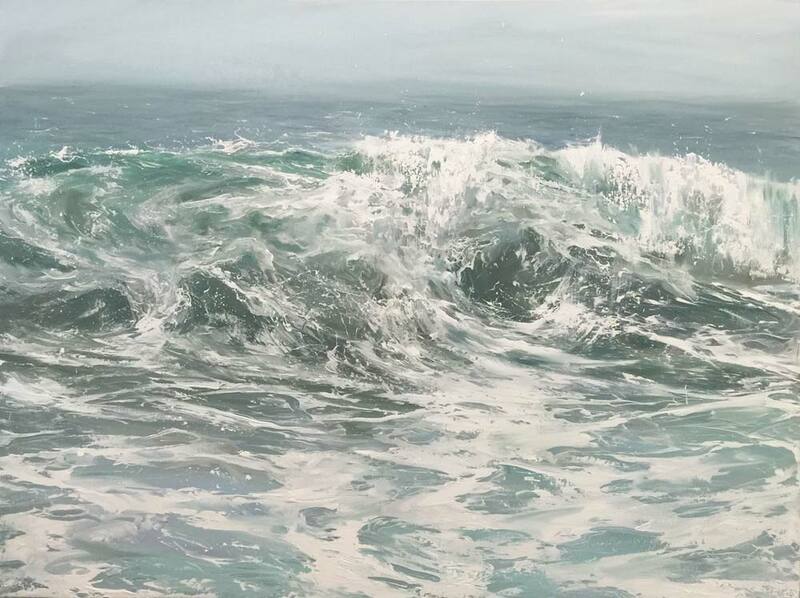 I don’t think I’d stop painting water even if I didn’t live on the coast. Click anniewildey.com to see Wildey’s prints and further paintings. Her work has been shown from The National Museum of China to the Mall Galleries, London, The Heckscher Museum, New York and The University of Connecticut. 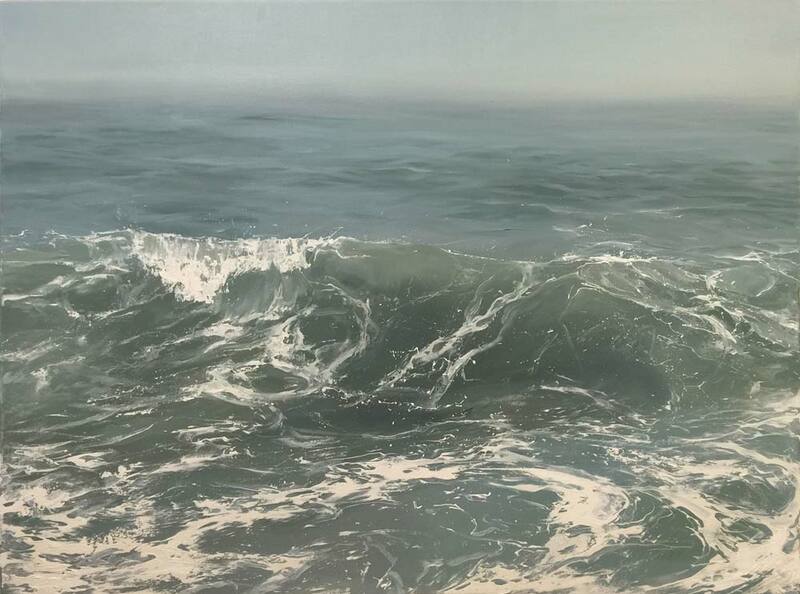 Upcoming group shows include Fresh, a three-person exhibition at the Eisenhauer Gallery, Martha’s Vineyard, and Water/Bodies, Southhampton Art Center. 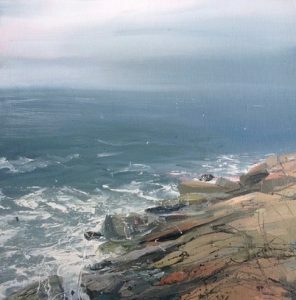 Wildey’s paintings will also be exhibited in Endless Summer, Westerly Land Trust, Westerly, R.I. until mid-August; From the Academy, The Vendue Hotel Charleston S.C. until late September; and Twelve at Robert Lang Studios, Charleston, opening October 7. Great Article!!! I love Annie’s work, she really knows how to capture a mood. I could look at her paintings all day. This are rich, gorgeous paintings. 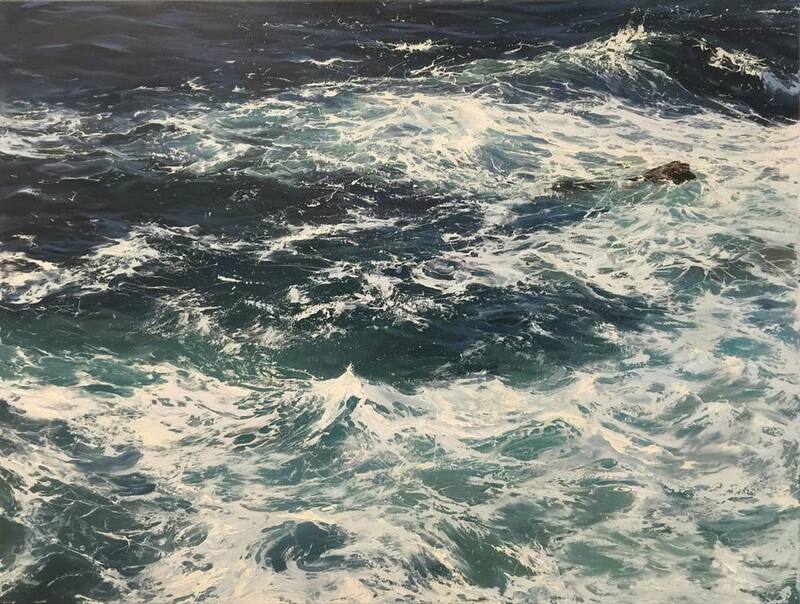 I have spent a lot of time looking at the ocean, but never particularly cared for paintings of it — I always felt they failed to capture the depth, the power, the mystery of masses of water in motion. These do, these really really do. These oceans of Annie Wildey are amazing. So compelling that I wanted to swim in the waves. Or at least walk out to them. 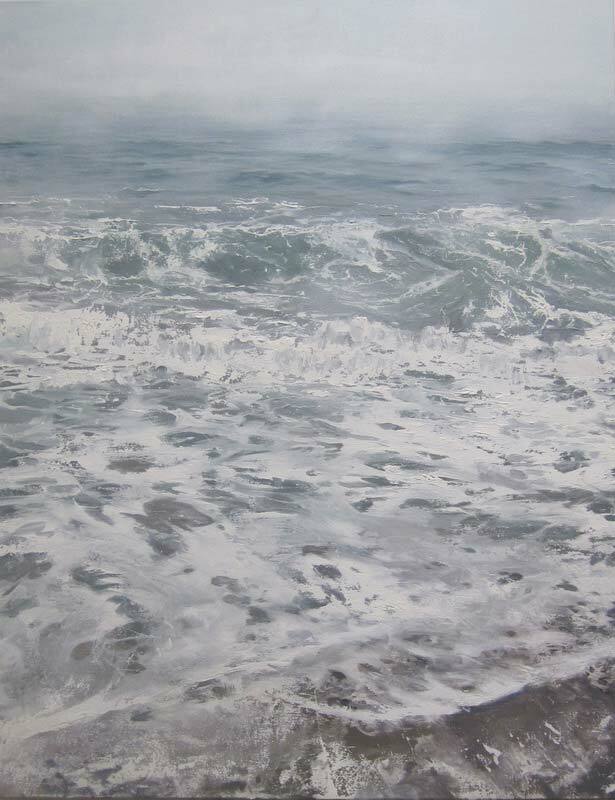 Thank you, Ms. Wildey, for capturing the sea in such evocative and arresting ways. And thank you, art editor Elizabeth, for your fine article and introducing me to the art of Annie Wildey. This is a beautiful article Annie! There is always so much to learn about you and your art. SO inspiring!